US Representative Mike Turner (R-Centerville) speaks at the monthly meeting of the Ohio Chapter of the National Military Intelligence Association on Tuesday. 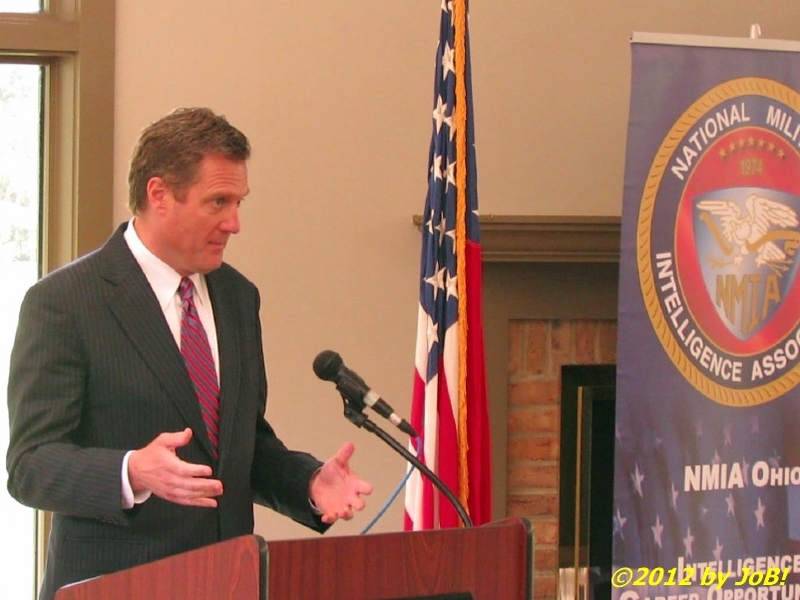 The Ohio chapter of the National Military Intelligence Association held its monthly membership meeting at Wright-Patterson Air Force Base's Twin Base Golf Course clubhouse this past Thursday. United States Representative Mike Turner (R-Centerville), currently of Ohio's 3rd Congressional District (which will convert to the 10th Congressional District next January), was the guest speaker for the gathering, where he provided the approximately 50 attendees with a brief overview of his more recent legislative activities on behalf of the base community. He was introduced to the membership by the chapter president, Dr. Deanne Otto. Turner, a five-term congressman and former Dayton mayor, is a senior member of the House Armed Services Committee and chairs that body's Strategic Forces subcommittee and also serves on their Tactical Air and Land Forces subcommittee. He is also a member of the House Committee on Oversight and Government Reform, where he serves on the National Security, Homeland Defense and Foreign Operations subcommittee. In addition to these assignments, Turner also belongs to several congressional caucuses and task forces where he actively advocates on issues important to his district, which includes Wright-Patterson Air Force Base, the state's largest single site employer, and its over 25,000 airmen, civilians and contractor personnel assigned to the installation. Being on a very tight schedule, Turner confined his comments to the subjects of emerging intelligence areas and the current financial issues facing the Congress and the nation to include sequestration of defense-related expenditures, base realignment proposals, and the National Defense Authorization Act that was recently passed by the Armed Services Committee. He also touched upon the domestic use of unmanned aerial vehicles and systems and took several questions from the audience. Before his main topics, he first recognized Don Bergin, his director of military affairs, as well as members in the Dayton military and intelligence communities for giving the congressman "an ability to help bolster what happens at Wright-Patterson Air Force Base." In his subcommittee leadership role, Turner says that he sees today's "front page" issues on a regular basis, such as Iran, North Korea, missile defense, military intelligence, cyber security and space-related activities. Due to this elevation of importance, he told the gathering that the Strategic Forces subcommittee "has gotten a great deal of input and interest as we put look to what are we going to do in the future and how are we going to fashion our national security programs and platforms." What Turner sees as the biggest threat to managing these potential problem areas is the looming sequestration to Department of Defense funding for fiscal year 2013. He provided the audience with some background information describing how these mandatory spending cuts, estimated to be nearly $500 billion over the next 10 years, came into being and his own position on the issue. "I voted against this mess because I was not convinced that this committee, this group of 12, was going to be able to do indirectly what the three parties were not able to do directly," explained Turner. He also stated that national security should not be punished for the inability of Congress to do its job and understood that "if sequestration were to happen, about 6,000 jobs in Ohio would be at risk." To alleviate their concerns, Turner told the attendees that the Armed Services Committee's version of the 2013 National Defense Authorization Act included backfills and offsets for that year but that leaves 2014 "yet to be undone." Although no legislation has been presented by the Senate on this issue, he feels that they will also take similar actions this year to backfill proposed defense spending cuts and that a permanent solution to this looming funding crisis will not occur until after the presidential election this fall. On the subject of realignments, Turner said that the Obama administration has proposed two Defense Base Realignment and Closure (BRAC) commissions to be held over the next two years to investigate ways to achieve increased efficiencies that are in line with Congressional and DoD objectives. In response, the Armed Services Committee has inserted language into the House's upcoming funding bill that would prohibit the holding--or even planning--of a BRAC for 2013 and pushes the first one back to 2014 to avoid any "additional uncertainty" to military communities in the current "uncertain environment." When discussing his work on the National Defense Authorization Act, he brought up a recent success story concerning the Air Force Institute of Technology (AFIT), a base tenant unit. Identified as an "at risk" organization during the 2005 BRAC, he and the Wright-Patterson community were able to identify ways to reduce its vulnerabilities to that commission and to widen its application to the whole defense community. Turner was able to insert language into legislation that strengthened AFIT's leadership and to work with the Air Force to open its curriculum to non-military defense student, a move "that would be an additional source of revenue but also strengthen the student body count, which goes right to the issue of the faculty that is there and the resources that they have." This past month, the school took its initial steps in that direction when it welcomed its first civilian director and chancellor. "There are almost more than a hundred of these types of items where we work together as a community, that has a long 4- or 5-year turn, that makes a difference out at Wright-Patterson Air Force Base," Turner added, "giving me the ability to advocate for those legislative changes to make a difference." Others involved allowing the National Air and Space Intelligence Center (NASIC) greater flexibility in hiring civilian employees and for AFIT to provide training and instruction for NASIC personnel in the areas of preventing, identifying, responding to, and tracing cyber attacks. In finishing his prepared remarks, Turner touched upon the issue of unmanned aerial vehicles/systems (UAVs/UASs) and the opportunities that Wright-Patterson and the local area may enjoy with the opening of US airspace for this activity. "This is something, obviously, that the Air Force has a tremendous experience in, " he said, "that should be leveraged when we look to opening our domestic skies." Turner sees the Air Force, the National Aeronautics and Space Administration (NASA), and the Federal Aviation Administration (FAA) becoming linked so that the military's needs and expertise are factored into all facets of UAV/UAS operations. The 2012 National Defense Authorization Act mandated the FAA to select six test sites as part of a program to safely integrate these vehicles/systems into the nation's air traffic system by 2015 and, due to the advocacy of Turner, Boehner and other members of the Ohio congressional delegation, Wilmington Air Park, the former DHL air hub, is expected to be a top contender. During the question-and-answer session, Turner discussed the base's recent decision to close the Aero Club, congressional redistricting due to the 2010 Census, and the development of protocols to govern UAV/UAS usage within the United States. On the loss of two House seats--and one of those being the seat currently held by fellow base advocate Steve Austria, he called it a "travesty" and "disturbing for our whole community and our whole region." Turner did counter this bad news by saying "we will absolutely continue to have John Boehner's commitment" as well as other Ohio lawmakers for issues related to Wright-Patterson and Dayton. The congressman stated that safety and privacy are the two major issues that need to be included in the "national dialogue" prior to layering unmanned vehicles/systems into our national airspace in the coming years. The National Military Intelligence Association is the nation's sole joint military intelligence professional association and seeks to stimulate awareness of the need for effective military intelligence as a critical component of national security. The Ohio chapter is comprised of military, civilian and contractor personnel from Wright-Patterson Air Force Base and the surrounding communities and boasts the largest membership of the three NMIA chapters nationwide. Their next meeting is scheduled for June 26, 2012, which will feature a panel discussion on emerging trends and technologies in the intelligence world.